SHREVEPORT OFFICE HOURS: Mondays and Thursdays, 1:00-4:00 p.m.
Conveniently located in our Shreveport office, Gabriel’s Closet serves low-income new parents, their infants, and small children. 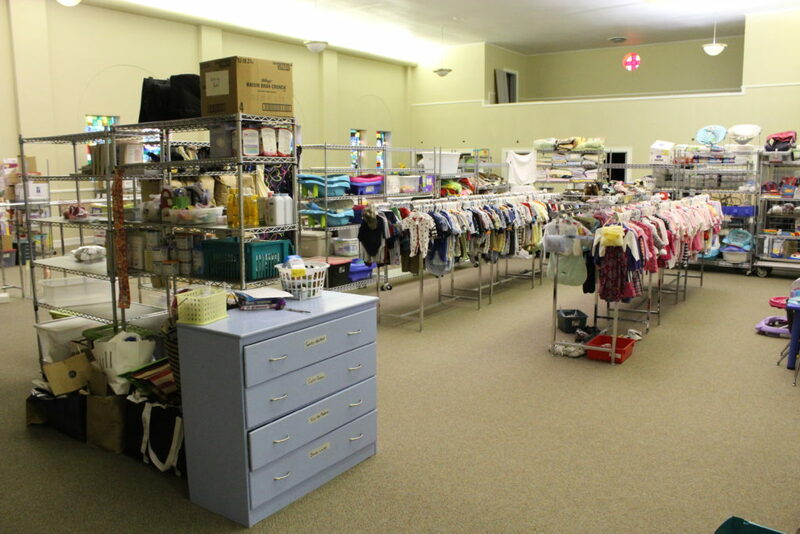 The shop, largely run and staffed by volunteers, helps parents get off to a good start by supplying many of the items that they might need for their children. Gabriel’s Closet is a program that provides education, assistance, and support for parents of young children (ages 4 and younger). Parents complete an application and meet with a case manager to assess their most pressing needs. We offer a merit-earning program which allows parents to redeem earned merits for items from Gabriel’s Closet. Gabriel’s Closet has many baby essentials including pack ‘n play cribs, baby beds, high chairs, car seats, strollers, walkers and more, as well as a large selection of gently-used or brand-new clothing. We also offer diapers, ointments, bottles, pacifiers and more. As part of our educational component, we offer classes in prenatal and infant care, breast feeding, parenting, school readiness, and more, taught by volunteers who are experts in these areas. Parents are required to take a minimum of one class before they many receive additional assistance.